Have you seen Ansel Elgort, Jamie Foxx, Amy Schumer, Kevin Spacey, or Edgar Wright in town? Now that we’ve made it through the slow winter holidays, filming is back full-force in Atlanta. The Hollywood of the South is stronger than ever, with new productions popping up each month. Here’s our latest report on what’s shooting where, which signs go with which films, and who you might just run into next time you’re walking around the city. All Eyez On Me (production code: AEOM) continues to be the most visible project in Atlanta this month. Since our last roundup, the Tupac biopic spent some time in Norcross before moving downtown, shooting on Broad Street just south of Martin Luther King Jr. Drive on January 31. We next spotted crews in Midtown near the Bank of America Plaza in early February. All Eyez On Me stayed in Midtown until February 12, when it shot at Marietta’s Picture Show Dollar Theater. The basecamp was located at nearby Mt. Zion Methodist Church. Most recently, AEOM signs returned to downtown Atlanta on February 17 and 18. Still, production crews have been busy. At the end of January, signs were spotted at the Westside Provisions District off of Howell Mill Road, and on February 12, they were posted around Union City. On February 17, they took over Criminal Records in Little Five Points. This past weekend, Ansel Elgort was spotted downtown on set at Forsyth Street, and if you took advantage of this weekend’s warmer weather, you might have even seen a sign on the Beltline Eastside Trail, just north of Ponce City Market. Another new production, Thank You For Your Service (TYP), stars Miles Teller, Haley Bennett, and Amy Schumer in a rare dramatic role. The film tackles how PTSD affects American veterans returning home after wartime. They shot in Piedmont Park on January 29 and over by Emory’s Briarcliff campus during the second week of February. We also saw crews near the federal prison in south Atlanta on February 16. After that, the production moved to Kennesaw at McCollum Field. Next week, they’ll be shooting in Gainesville. Oprah’s Greenleaf (GL) television series filmed additional scenes this month. On January 25, they shot at The House of Hope Greater Travelers Rest Baptist Church in Decatur, then at the Atlanta Civic Center until January 27. February 1 brought signs to Buckhead, and most recently to Jimmy Carter Boulevard and Best Friend Road in Norcross. Starz series Survivor’s Remorse (SRS3) has returned to shoot its third season (hence the sign code change from last year’s SRS2). On February 9 through 12, a basecamp was set up at Trinity Presbyterian Church on Moore’s Mill Road. On Valentine’s Day, more signs were spotted near the Governor’s Mansion. The Vampire Diaries (LOC) filmed in Decatur on February 16 and 18. Its sister show, The Originals (TOGS), shot in Covington on February 10, Conyers on February 19, will spend Monday in Madison. FOX’s Sleepy Hollow (SH) continues to work in Conyers. 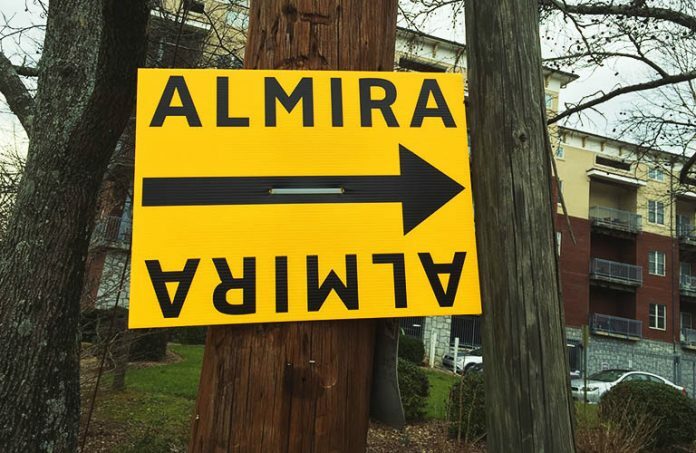 Devious Maids (DM) has been busy filming around Stone Mountain, and Netflix’s Winona Ryder-driven series Stranger Things (ST) was in Douglasville on both February 6 and 12. We even saw reshoots during the waning days of January for Fist Fight (S&K), starring Ice Cube, Christina Hendricks, and Tracy Morgan, in east Cobb county. Next month, be on the lookout for Hidden Figures, a film following the unsung African American mathematical geniuses who were involved in NASA’s early days. And we’re hoping by our next roundup, Guardians of the Galaxy Vol. 2 might finally go outside of Pinewood. Until then, enjoy these trailers for the Atlanta-filmed The Divergent Series: Allegiant and Chris Pratt’s viral, uplifting Atlanta-based Instagram from this past month. It’s 3:20am. I got picked up for work at 6:45am yesterday. I’m not good with math, especially after being up for approximately 61 hours but I think I’ve been up for over 77 hours. I did a table read for Guardians of the Galaxy 2 this morning and then shot all day on Passengers and just now wrapped some 144 hours later. Weirdly both films, which iI’l be shooting back to back, are being shot in Atlanta at Pinewood studios. We have the best crew. Total rock stars busting their asses. And the stuff we’re shooting. My God. I can’t wait for you to see it. I go back in in about 8 hours to do more. I am doing what I love. It doesn’t feel like work. Even though it is. I’m having fun. I’m overcome with joy and gratitude. I felt like posting this to say to anyone out there chasing your dream… Fifteen years ago I felt the same passion I feel today, but I had very little opportunity. I had to hustle hard and go hungry. I had to eat sardines and figure out how to get gas money. And I never had a plan B. I never stopped believing. Ever. Don’t give up. Apply constant pressure for as long as it takes. It will break before you do. Go get it.